Tom Fulton had a zest for life and radio. His enthusiasm for living was matched only by the thrill he got from being on the air. His was a life lived to the full, and everyone who knew him either personally or as a listener lost a friend when he passed away Dec. 9, 2002. Tom began his radio career in B.C. in the early '60s, moving to CJCA Edmonton in 1964. In 1965, it was off to Toronto, and eight years at CKFH. Tom was the afternoon drive host at 'FH when they switched to a Top 40 format on Jan. 2, 1967. He eventually worked every shift there except the all-night show in helping establish CKFH as one of Canada's leading Top 40 stations. 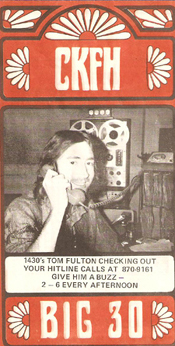 Tom left CKFH in 1973 and was out of radio for a short time. In 1975, he began a new phase in his career, as a news and entertainment host at fine arts CJRT-FM in Toronto. He stayed there 23 years. In the 1980s, he also had stints as morning man at oldies-formatted FM 108 and afternoon drive host at CJCL, the former CKFH. Tom moved over to CFRB in 1998 where he spent two years as a weekend talk show host, often filling in for his old CKFH buddy John Donabie. In 2000, he got the itch to return to a music format, and in December 2000 made his debut as morning man at oldies/standards formatted CHWO 1250 Toronto. Tom was AM 740's first live host when CHWO officially switched frequencies on January 8, 2001. Tom played a key role in getting the new AM 740 established and a long and fruitful association was anticipated. Sadly, it was not meant to be. On December 9, 2002, just minutes after finishing his morning show at AM 740, he collapsed and died of a heart attack. He was 58. He was survived by his wife, Cheryl, and his son Jesse. 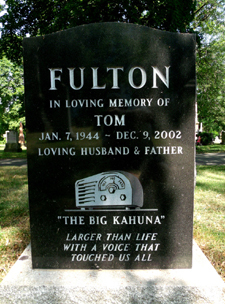 Our lives are richer for having known Tom Fulton, either personally or as a voice on the radio. Rest In Peace, Tom. It was 1967 and the times they were 'a changin'. Rock 'n' roll radio was no longer the preserve of the AM band. FM stations had started to play rock, what with the emergence of stations like WOR-FM in New York and KPPC in Los Angeles. The music was also changing. No longer was a rock station's playlist necessarily restricted to the Top 40. Concept albums were emerging, and some program directors were digging a little deeper for their music. One station that really dug deep was CKFH. 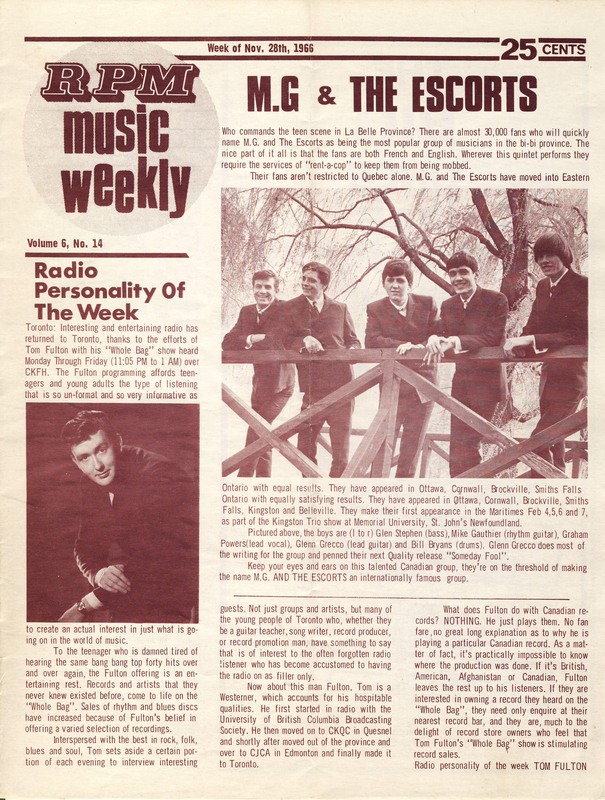 After years as a middle-of-the-road station, 'FH went rock on January 2, 1967 and Toronto radio listeners were in for a surprise. 'FH went way outside the Top 40, playing album cuts, R&B, British rock and Canadian artists that were not being playing by its competitors. In many ways, it was underground radio on AM, predating the legendary CHUM-FM by a year-and-a-half. The 'FH deejays were also special. Don Daynard, Dan O'Neil, Tom Fulton, Big "G" Walters, Kenny Wells, Norman B., John Donabie, Mike Williams and Gary Dean all had their own unique styles that made listening to Number 2 Radio such an experience. And imagine that, a station marketing itself as the number two station because everyone else is number one. To enjoy Tom Fulton, click here. In another rare peek at 1967 Toronto radio, Tom appears on CKFH's afternoon drive. Among other things, he reads the local bowling results. When Tom Fulton arrived in Toronto from B.C. in 1965, he did not have a radio gig lined up. He didn't have any airchecks of himself, so he simply sent a picture of himself and a poem he had written to several radio stations in the area. It's hard to imagine that approach working today, but in the days where radio jobs were aplenty the unusual approach struck a chord. Surprisingly, the taker was staid old CKFH, which had yet to switch to a rock format. Eventually, however CKFH did delve into rock, albeit slowly. First, Fulton was asked to do a "teen show" from 4-6 p.m. in addition to his 10 a.m.-2 p.m. shift spinning Mantovani records. Later, a groundbreaking progressive rock show from 11 p.m.-1 a.m. called The Whole Bag was added and guess who was the host? Fulton may have been the only deejay to work a triple split shift on the same station with three different formats. By 1969, Fulton's workload eased somewhat: he was doing one shift a day in one format a day - playing Top 40 records on the Big 143. Doug Thompson sent us an article on Fulton from RPM Magazine's issue of November 28, 1966. Thanks Doug! 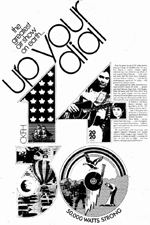 On January 2, 1971, CKFH celebrated its fourth anniversary as a Top 40 station. Much had changed since day one - January 2, 1967. Original morning man Don Daynard left CKFH in 1969. He was at CFRB in 1971 and would head to CKFM later in the decade. By 1987, Daynard was at CHFI. He retired from weekday radio on December 10, 1999, but continued with CHFI's Saturday Night Oldies Show. Midday host Dan O'Neil headed back to the U.S. after leaving CKFH in December 1967, resurfacing in Canada in 1973 at CKGM Montreal. By the 2000s, he was in sales at WNAV Annapolis, Maryland. Big G. Walters, host of the late-night The Whole Bag in 1967, was long gone from CKFH by 1971 but would make a Toronto appearance at CFTR later in the '70s. He later moved to CKPR Thunder Bay, Ontario, and died in December 9, 1999. Norman B., who did the all-night Where It's At show in 1967, was still in Southern Ontario radio in 1971. He retired temporarily from radio while at CHOW Welland, Ontario, in 1975. He returned to airwaves in 1979 at CING-FM, where he was also program director. Norman died January 19, 1997. The only 1967 on-air originals left at CKFH in 1971 were Tom Fulton and Mike Williams. Fulton, who did afternoon drive at CKFH in 1967, was on middays at CKFH by 1971. He went to fine arts CJRT in 1975 and then moved to become the morning man at CHWO (AM 740) in Toronto, an oldies-standards station. Fulton died of a heart attack December 9, 2002, shortly after finishing his air shift at AM 740. Williams, who did weekends at CKFH in 1967, was the station's morning man by 1971. He left 'FH in 1973 and died in a car accident December 30, 1985. CKFH became CJCL in 1981, and moved from the 1 Grenville Street location in 1993. You'll find a recording studio and some offices on the second floor where 'FH used to be. CKFH itself is now CJCL (The Fan 590.) The old CKFH frequency at 1430 is now occupied by the multicultural station CHKT, which is actually the successor to CKEY. Hear Tom Fulton on CKFH here. This aircheck is dedicated to the memories of deejays Tom Fulton, Mike Williams, Big G. Walters, Kenny Wells and Norman B., station manager Gerry Wilson, music director Jack Winter and station owner Foster Hewitt. Football fever was in the air - and Christmas was just around the corner - when this aircheck was made on a chilly, rainy November afternoon in 1971. Tom Fulton is one of several familiar voices you'll hear on this aircheck. There's also Mike Williams doing a remote, Robert E. MacIntyre introing the news, a commercial with program director Duff Roman, and legendary track announcer Daryl Wells with the race results. Lots of Christmas references, but no holiday music yet (the days of 24-7 Christmas stations in November were many years away). Throw in the jingles, commercials, promos and the hit music of the day and you have a magical aircheck. Enjoy the Tom Fulton show on CKFH here. When CKFH moved to a full-time rock format on January 2, 1967, Fulton took over the afternoon drive spot. He would work every on-air shift at 'FH except the all-night show before leaving the station in the early 1970s. On January 8, 2001, Fulton achieved another first. He hosted the debut show on AM 740, CHWO, when that Oakville, Ontario-station began regular broadcasting on that frequency on January 8, 2001. Fulton was AM 740's first morning man, having joined the station after doing weekend mornings at Toronto's CFRB. Enjoy Tom Fulton on CKFH here. 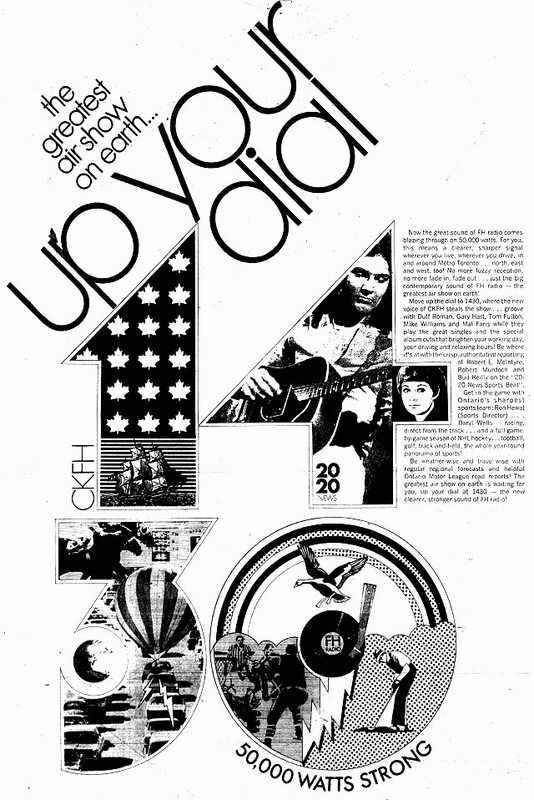 By 1972, CKFH was nearing the end of its life as a Top 40 station. Subsequently, Tom Fulton was concluding his career there. Fulton left 'FH in 1973, resurfacing at Toronto's CJRT in 1975. He spent 23 years at CJRT and his long-running author interview show at that fine arts station was very well received. After a couple of years at CFRB, Fulton moved to CHWO (AM 740) in Oakville in mornings in 2001. As for CKFH, it went to an mostly oldies format in 1973 and then flipped to country in 1975. On March 21, 1980, 'FH changed call letters to CJCL and format to talk (Fulton returned for a while while continuing at CJRT). In September 1983, the format became Music of Your Life. On September 4, 1992, CJCL became Canada's first all-sports station as The Fan. It moved from 1430 to 590 kc in February 1995, flipping with CKYC which became ethnic-formatted CHKT. 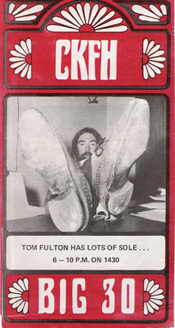 Here's the third of three airchecks of Tom Fulton on CKFH from September, 1972, and it's a two-parter. Station: AM 740 (CHWO) Oakville, Ont. Tom Fulton was a great friend of Rock Radio Scrapbook. He was very generous in March 2000 in donating several airchecks from his CKFH days to the site. It was a real shock to learn of his death from an apparent heart attack on December 9, 2002, just minutes after his morning show at AM 740 (CHWO). He was 58. A few months before his passing, we recorded an aircheck of Tom and the rest of the "Breakfast Crew." Enjoy Tom Fulton on AM 740 (CHWO) (UNSCOPED) here. Enjoy Tom Fulton on AM 740 (CHWO) (SCOPED) here. Tom Fulton was a man who cared about people. He was a giving person who loved to help others. Tom told a story of helping on his last show that really captures the essence of the man. He did that piece a few minutes before 8 a.m. on Monday, December 9. About an hour later - shortly after his show ended at 9 a.m. - Tom suffered a heart attack and died. Listen to Tom Fulton on his last day here. One year to the day after Tom Fulton's passing, AM 740 newsman Bob Durant did a wonderful tribute to Tom as part of his Durant's World commentary. Bob had worked with Tom since AM 740's beginning in January, 2001. Before that, they worked together at CFRB Toronto. Hear Bob Durant's tribute to Tom Fulton here.